Beauty purge continues, and today I am going to show you the only remaining member of my cream eyeshadow collection. Some of you will probably be surprised that I am getting rid of all these beautiful products [some of which were Limited Edition], but no matter how stunning they are, they’re only worth keeping if I actually wear them, right? Swatches top to bottom: Jouer Creme Eyeshadow Crayon Renaissance, By Terry Ombre Blackstar 4 Bronze Moon, By Terry Ombre Blackstar 5 Misty Rock, Laura Mercier Caviar Stick Eye Colour Rosegold, L’Oreal Infallible Paints Eye Shadow 316 Cool Ivory. L’Oreal Infallible Paints Eye Shadow 316 Cool Ivory* ($8.99) – These new-ish Infallible Paints eyeshadow duos were fun to play with, but in the end I determined that they are a bit too fussy for my quick everyday looks, since I had to use my fingers to apply them. The longevity and the pigmentation were very good, though. I think someone with more patience than me will find these duos quite impressive. Laura Mercier Caviar Stick Eye Colour Rosegold ($29) – I think I got this travel-sized Caviar Stick in a subscription box, but the amount of product in it was more than enough for months of use. I love the beautiful neutral color, but it did crease on my oily lids slightly. By Terry Ombre Blackstar 5 Misty Rock ($38) – Ombre Blackstar was my introduction to By Terry, and the product that got me hooked on eyeshadow pencils to begin with. I tried them before but wasn’t a huge fan until I splurged on this one. My tastes in makeup have changed and I haven’t worn this one, or Bronze Moon in ages, but I still think it is the best formula I’ve ever tried. $38 may sound insane, but I feel like it was money well spent. By Terry Ombre Blackstar 4 Bronze Moon ($38) – After several months of using Misty Rock I splurged on Bronze Moon so I could do duotone makeup with both of them. 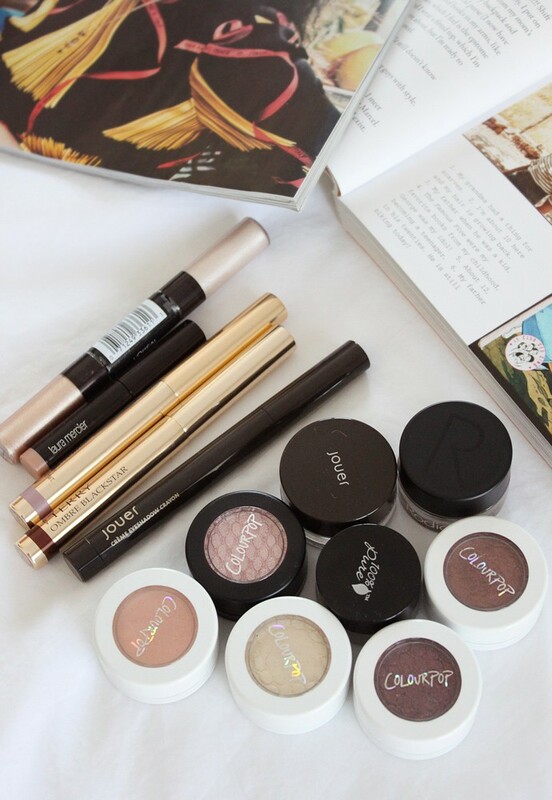 Seriously love this bulletproof formula – it won’t smudge, crease, or melt off in 90 degree weather. I can’t recommend these enough! Jouer Creme Eyeshadow Crayon Renaissance ($24) – The formula reminds me of Ombre Blackstars in longevity and Caviar Sticks in creaminess. Jouer products in general feel luxurious and high quality, I just haven’t reached for this one in ages and it needs to be tossed anyway, because it smells funny. Maybe if I bought a different color I’d use it more often, but I just don’t feel like adding more to my collection right now. 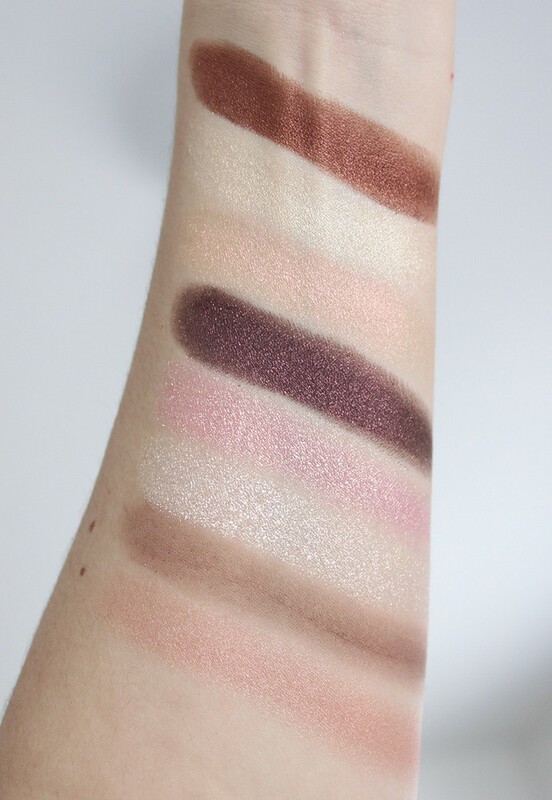 Swatches top to bottom: ColourPop Super Shock Shadow Boy Band, ColourPop Super Shock Shadow High Tide, ColourPop Super Shock Shadow Too Soon, ColourPop Super Shock Shadow Stereo, ColourPop Super Shock Shadow Just Fur Fun, Jouer Long-Wear Creme Mousse Eyeshadow Celestial, Rodial Eye Sculpt, 100% Pure Fruit Pigmented Satin Eye Shadow Java. ColourPop Super Shock Shadow Boy Band ($5) – A few years ago I had a Colourpop phase and bought a ton of their cream eyeshadow singles. Good news is, they’re fairly inexpensive. Bad news: I barely used most of them. Oops! Boy Band is a warm bronze that I expected to use a lot, but I don’t remember the last time I did. It’s still in good condition so I’m going to pass it on to a friend instead of tossing. ColourPop Super Shock Shadow High Tide ($5) – High Tide is a yellowish shimmery off-white. I didn’t love the way it looks on my skin tone, so I shoved it to the very back of the drawer and eventually the product in the pot just dried out. ColourPop Super Shock Shadow Too Soon ($5) – I loved this shade, but it totally dried out after three years, and it was LE so I don’t think I can even get it anymore 🙁 Check out this blog post for a makeup look I created using this beauty. ColourPop Super Shock Shadow Stereo ($5) – I bought Stereo with the intention of using it as an eyeliner, but guess what, I’ve done that exactly zero times. I might as well just give it to a friend while the product is still good. ColourPop Super Shock Shadow Just Fur Fun ($5) – Just Fur Fun is a very pretty pink metallic with gold shift. The pot was sitting in the drawer untouched, and I don’t even remember buying it! Right now I’m using one of those new Physicians Formula Butter Highlighters as my pink shimmery eyeshadow and I’m happy with it, so I will pass this on to a friend. It’s a beauty though! Jouer Long-Wear Creme Mousse Eyeshadow Celestial ($30) – This snow white glitter cream eye shadow stays put on the lids and doesn’t create fallout. I used it a lot until about a year ago when I started wearing more matte shades. Even after all this time the product is still in great shape. 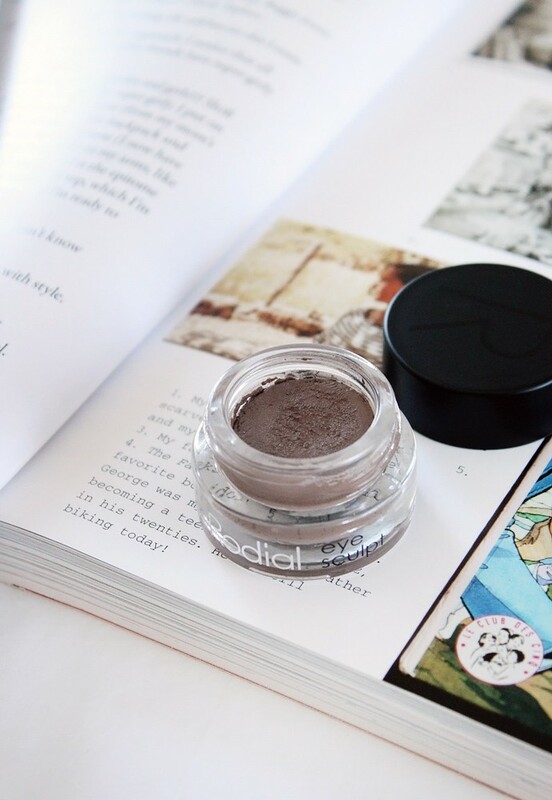 Rodial Eye Sculpt* ($38) – This effortless neutral brown color is the ideal hue to add depth to the eyes without looking like you have obvious makeup on or trying too hard; my swatch here really doesn’t do it justice. The effect is like contouring for your eyelids: soft natural shadows that blend into the skin. I use this one a lot! 100% Pure Fruit Pigmented Satin Eye Shadow Java* ($26) – It’s the only 100% natural eye shadow on my list today. The formula differs from conventional products: it’s creamier, more dense, and less pigmented. Although it lacks in pigmentation and longevity, it delivers big time on skin benefits: a blend of nourishing botanical butters and extracts cares for the delicate upper lid area during the wear. Unfortunately, after almost a year of use the product completely dried out – I had a hard time scraping it out for the swatch. The sole survivor of my cream eyeshadow purge – Rodial Eye Sculpt. Surprising pick isn’t it? In the end I only kept one of these – Rodial Eye Sculpt*. At first I felt bad about saying good bye to so many gorgeous products, but the whole point of this purge is to mercilessly get rid of stuff I don’t use anymore. Besides, cream products have a shorter shelf life compared to powder products, so I should have probably tossed some of these long ago. Rodial Eye Sculpt* is one of those unsung makeup heroes that doesn’t create a lot of drama, but the impact is undeniable. When I first tried it, I thought the color was super boring, but once I began using it for my everyday looks, I kept reaching for this pot over and over. It’s a beautiful product that deserves more recognition, that’s for sure. 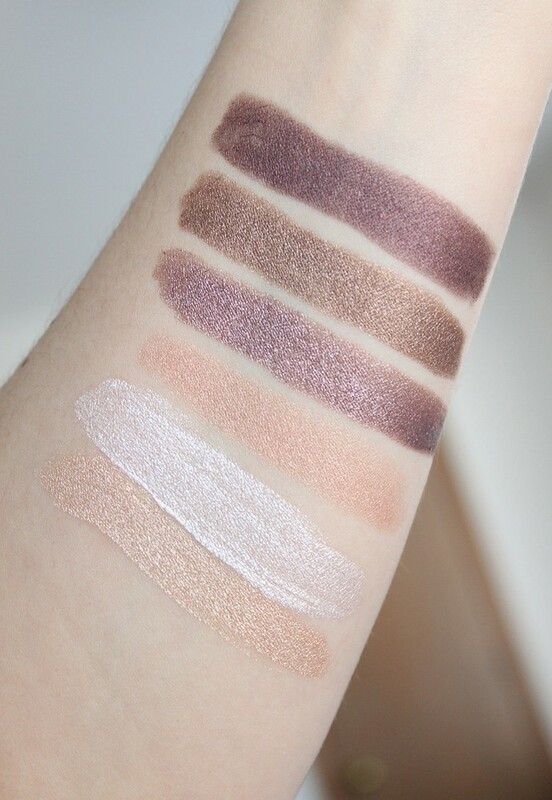 What’s your go-to cream eyeshadow? Have you tried any of the products mentioned in this post? Let me know in the comments below!